To maintain and grow mammalian cells in vitro is of great biological interest since mammalian cells are the dominant expression systems to produce therapeutic proteins and would be useful in the study of drug delivery and complex biological process, such as cell differentiation and tumor metastases. The requirements and basic tools have not changed a lot over past decades. Differentiated mammalian cell lines are mortal, which only survive limited cell passages, while undifferentiated cell lines, such as cancerous cells, are immortal, which can propagate indefinitely. Mammalian cells either grow on support surface (anchorage-dependent cells) or in suspension culture (nonanchorage-dependent cells). For anchorage-dependent cells, they must attach to and spread on a surface to be viable. In macroscale culture, cells are attached on the glass surface of T-flask or roller bottles. Extracellular matrix can also be added to promote cell attachment. When mortal mammalian cells form a monolayer on support surface and cells contact with each other, the cell division will be inhibited. Then proteolytic enzyme trypsin will be added to separate cell aggregate and continue cell passage. The traditional growth medium for mammalian cells includes carbon and energy source to provide nutrient, inorganic salts to maintain osmotic pressure and growth factors. Serum are most commonly used reagents to provide growth factors, which also contain amino acids, hormones, vitamins, lipids and minerals. The undefined compositions of serum sometimes complicate cultivation process thus defined media have been developed without serum for specific cell lines. Macroscale mammalian cell cultivation modes in research lab can be divided into non-stirred system and stirred system. Common non-stirred systems include T-flask and roller bottles and stirred system has spinners flask. Mammalian cells are usually cultured at 37 °C and supplemented with 5% CO2 to maintain the pH of media. For some applications of mammalian cell culture, such as mesenchymal stem cell (MSC) therapies, requires precisely controlled soluble and mechanical factors microenvironment for MSC differentiation. Controlled microenvironment is essential to extract biologically meaningful data from cell assays. Microfluidics devices, integrating cell culture, reactions and assays in a single platform, are especially attractive due to their potential for high-throughput screening and mimicking in vivo-like microenvironment by precise control over fluid flow and local gradient. For anchorage-dependent cells, rigid substrates, such as plastic surfaces or glass, and soft substrates, such as polymers, are used in microfluidics devices, which is called 2D mammalian cell culture. Here we discuss one basic mode of 2D mammalian cell culture: perfusion flow mode. For highly perfused tissues types in vivo, such as kidney and liver, microfluidic perfusion mode may recapitulate physiological cellular microenvironment. By continuously supply and removal of media, the perfusion culture can create a definable microenvironment which would be otherwise impossible to achieve at macroscale since composition always changes in static culture and a continuous reactor in macroscale has large reagent volumes consumption. To design a robust microfluidic perfusion system, design, fabrication and micro-assays should be discussed in an integrated fashion. The design of microfluidic devices depends on the feature required by the application. Firstly, biomaterials should be selected for microfluidic channels and adhesion substrate of cells. All materials should be non-toxic, and materials choice may be further narrowed by assay requirements such as electrical stimulation/recording, chemical sensing, optical transparency, etc. Materials for channels and substrate can be the same, such as glass substrates and glass channels, or different, such as glass substrate and poly(dimethylsiloxane) (PDMS) channel. PDMS is the most commonly used materials due to its low cost, high optical transparency for imaging and biocompatibility. Additionally, the flexibility of PDMS allows us to create valves and pumps in microfluidic systems. However, the water vapor and organic solvent permeability limit the application of PDMS. Materials including silicon, silicon nitride, glass, PDMS are most commonly utilized as cell substrates in 2D microfluidic perfusion culture. Cells attach to intermediate molecules, typically peptides or proteins, instead of cell substrates directly, which requires substrates undergo surface modification to add intermediate molecules by physical adsorption or chemical bonding. Surface modification is a critical step to facilitate cell attachment in 2D microfluidic perfusion culture. The simplest 2D cell culture chamber design is growing cells as a 2D monolayer at the bottom surface of channel which have been used in some microfluidic perfusion devices. The effective culture volume (ECV) of culture chamber, characterized by large surface-area-to-volume ratio, measures the ability of cells to control their microenvironment. Laminar flow existing in culture chamber could be utilized for selective delivery of molecules. Several culture chambers connected by channels can be designed in a single microfluidic device to achieved parallelization. While some cell culture chambers are isolated from the bulk fluid to create a low shear stress environment. To maintain prolonged periods of culturing, effective sterilization of microfluidic devices is critical. Autoclaving of microfluidic device and techniques used in experiment is one of the most efficient way, while high temperature may cause damage to biomaterials or surface modification. Other sterilization methods can be used as substitutes, including incorporating sterilization chemicals during device fabrication, flushing with ethanol and exposing to UV light. In perfusion culture, nutrients, chemicals and oxygen must be delivered to cell efficiently while wastes should be removed. To precise control microenvironment in 2D configurations, cell seeding and immobilization strategies would be used to ensure cell-cell and cell-matrix interactions. Cell seeding is infusing external cell suspension into cell culture chamber, which is a dynamical process in microfluidic perfusion culture. The seeding cell density is critical due to its effect on the extent of cell-cell interactions and cellular behavior. The seeding flow rate should be low to decrease shear stress which compromise cell viability. But low flow rate would cause precipitate during seeding process and consequently non-uniform final cell density. In 2D microfluidic perfusion system, enough time should be allowed for sufficient cell attachment so that cells are not washed away by media perfusion. After cells are immobilized, the perfusion starts. 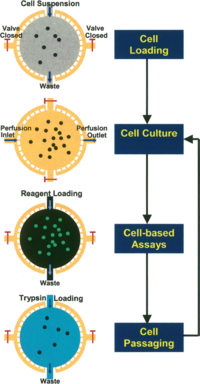 Two different modes of perfusion exist, non-recirculating culture and circulating culture. Non-recirculating culture is a counterpart of continuous reactor in macroscale, where the fresh culture media is continuously injected into the system and go to waste directly. The local concentration of testing factor can remain constant during the testing process. Recirculating culture is a counterpart of batch reactor in macroscale, where a relatively large volume of culture media circulates in the system. The microfluidic device can be placed in 37 °C, 5% CO2 mammalian cell incubator, however live imaging and other assays would become hard to achieve. Placing the device on a 37 °C hot plate to maintain the temperature. In the non-recirculating mode, acidic metabolites will be washed away and thus CO2 is not necessary to maintain pH. In the recirculating mode,The addition of HEPES buffer can maintain culture media at a constant pH between 7.2 – 7.4 under atmospheric conditions. Minimizing light exposure to culture system is necessary when operating outside of incubator since reactive oxygen species can be generated by light. In recirculating mode of microfluidics, no flow fate caused cell death due to the accumulation of waste and lack of nutrients. At slow flow rate, the proliferation was limited. At intermediate flow rate, cell density increased with flow rate. At higher flow rate, most cells were displaced, and morphology of remaining cells changed. Similar experiment results were observed in the non-recirculating mode. Slowest flow rate resulted in poor proliferation and higher flow rate resulted in nearly confluent culture on surface. Optimizing the mass transport aims to adjust nutrients and oxygen levels according to different cell type and control local concentration of metabolites. Most simple methods are changing flow rate and cell culture chamber height. By increasing flow rate and culture chamber height, the delivery of adequate nutrients and removal of toxic waste products would be more efficient. The 2D cell culture system is not accurate enough for simulating in vivo cellular microenvironment since cell-cell and cell-matrix interactions, mechanical forces are not fully recapitulated, while the 3D cell culture microfluidics platform allowing for regulated interactions are promising for mirroring in vivo cellular microenvironment more closely.